Sweden’s inflation outcome could have been worse for the central bank. While price growth fell short of the Riksbank’s forecast for a third month in March, the underlying rate provided some relief after two terrible months. Consumer prices with a constant interest rate rose an annual 1.8 percent, in line with analysts estimates. Underlying inflation edged up for the first month in three, helping push up the krona. 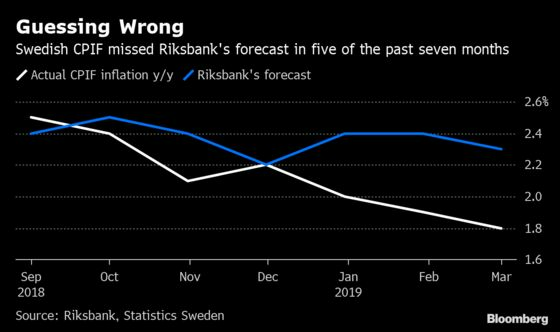 Inflation has been falling far short of estimates and slid below the Riksbank’s 2 percent target again, casting doubts on plans to raise rates again later this year. Policy makers raised rates to minus 0.25 percent in December, the first increase in seven years after a long battle to lift price growth. CPIF rose 0.2 percent in the month, with increases in food, clothing and fuel prices offset by drops in the price of electricity, books and package travel. CPIF excluding energy reached 1.5 percent, beating the analyst estimate of 1.4 percent. According to the latest Bloomberg survey report, economists now expect a rate hike in the final quarter of 2019, rather than in the third quarter. The next monetary policy decision will be announced on April 25. Claes Mahlen at Handelsbanken said the bank would stick to its September rate hike forecast after Thursday’s data. The krona initially rose on the news, but traded little changed at 10.44 per euro as of 10:50 a.m.